June 25, 2018, 2:00 p.m. When it comes to a smart phone, it’s probably safe to assume that most US consumers can explain what it is and what it’s capable of doing — indeed, figures from YouGov Profiles show that about 4 in 5 Americans own one. 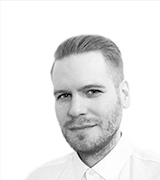 The same degree of knowledge, however, doesn’t appear to apply to the likes of smart refrigerators, smart kettles, and smart thermostats. New data reveals that while the majority of US consumers (62%) are aware of these smart appliances — devices that generally include a computer capable of connecting to the internet and can be controlled by phone or tablet — most people admit they don’t know much about them. 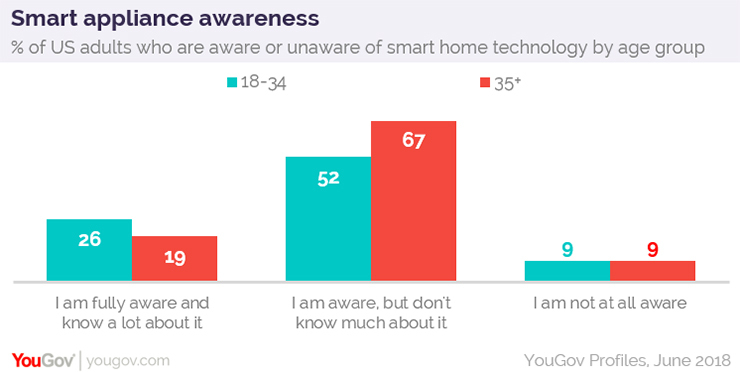 Just over half (52%) of adults aged 18-34 report being aware of the technology yet not terribly knowledgeable about it, compared to 67% of adults aged 35+. At the same time, 21% of consumers consider themselves fully aware of smart appliances and in possession of a great deal of information about them. In this case, more Americans aged 18-34 claim familiarity with, and understanding of, the technology than those aged 35+: 26% vs. 19%. Concerns about the new gadgets are varied, from difficulty setting them up to having to remember yet another password. The greatest worry, though, involves the cost: 36% of Americans are concerned that smart appliances are over-priced. Meanwhile, 34% express concern about getting hacked, 33% are uneasy about data privacy, and 30% report anxiety about not being able to use the devices if their internet isn&apos;t working. Overall, data from BrandIndex indicates that awareness of smart tech manufacturers is on the rise. Between January 2017 and today, for example, awareness of the brand Nest increased from 20% to 28%. The public&apos;s general impression of the company has improved, too.